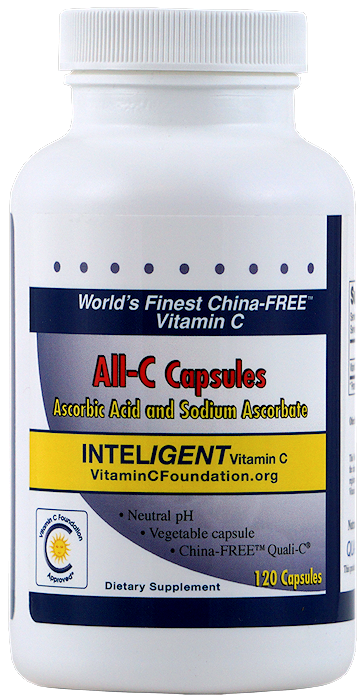 ALL-C INVENTORY FIRESALE - Buy 18 at $6.99 ea..
as approximately 50% L-ascorbic acid and 50% L-sodium ascorbate. The only filler (required for manufacturing) is Ascorbyl Palmitate - the fat soluble form of vitamin C.
Celluose capsules safe for vegetarians. I would just like to share with you the true miracle of your website. After 5 years of personal research in trying to cure myself and with several readings and re-readings of your website, especially Stone's papers, I was able to cure my fibromyalgia, chronic fatigue, severe circulatory problems, arthritis, and even a horrific swollen check with a toothache and bleeding gums. I have also had a heart attack and hemolytic urea syndrome years ago. 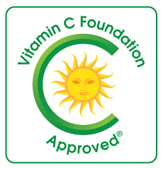 After listening to a speech by Dr. Levy in which he said "he had a hunch" that even chronic diseases could be cured if vitamin C was administered long enough and strong enough. So that is what I did. I started out slowly with oral supplements but couldn't tolerate it with bowels. So I bought his Lipo C and took 5-15 packets daily over the course of 7 days and suddenly nearly all my horrific ailments are gone. I even began sleeping at night!! I use to read blogs like this and refused to believe that they could be true. In the end, the research papers you have published is what finally clinched it. I even diagnosed my own subclinical signs of scurvy with your website. I am going to go to every one of my 200 doctors and give them copies of all this if it's ok. They have a lot of explaining to do! I also have at least 20 years of my past medical records of these ailments that I had to retrieve to file for disability. God Bless you all. I am soooo happy.